You know better than anyone one that your dog will chew through many things with ease! 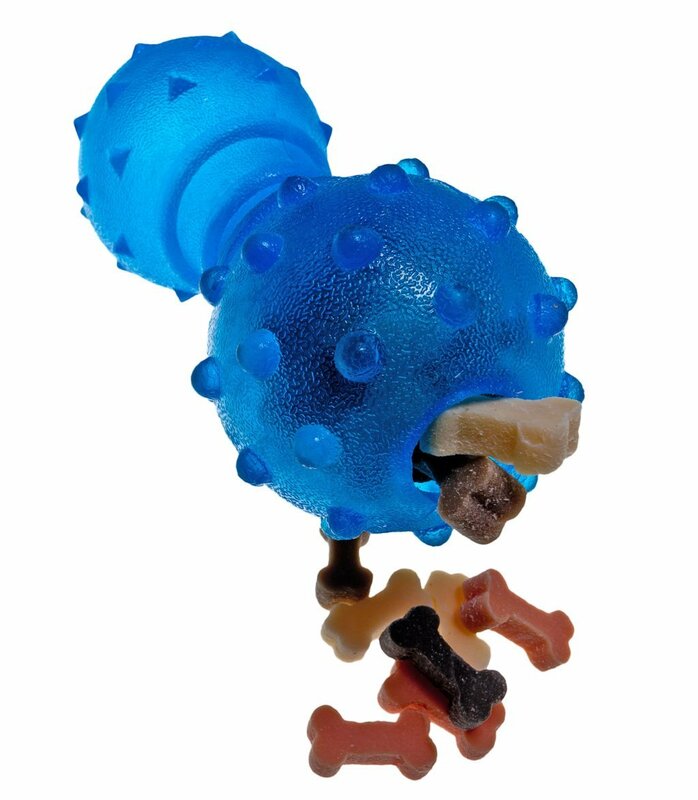 Choose a toy that will last and you’ll both get more enjoyment from it and it will protect your dog from swallowing broken pieces of the toy. But they can also be great entertainment. Double bonus! It may take some trial and error to find a toy your dog loves, but there are lots of options. 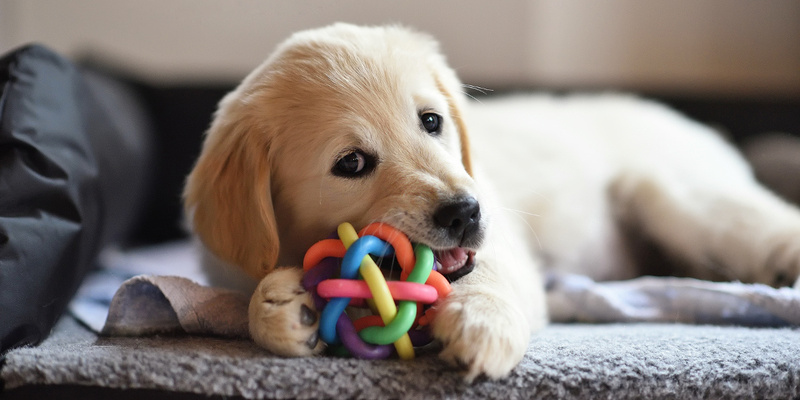 When you find a toy your dog loves, it’ll help keep them active and healthy. An older dog may be less willing to run around after a throwing toy (or even worse, they may continue to run around when they should be resting more). In contrast, a younger dog may benefit from a tough, chewable toy when they’re teething. And then there are other dogs who will take to every toy they are given! As a dog owner, we are responsible for encouraging good habits and behaviours from our dogs. Interactive treat toys can be part of that process, but be sure to monitor how much your dog is eating. Sometimes, keeping your dog occupied and entertained is a challenge. Just like kids, they get bored especially if their toys aren’t creative. If you are looking for a fun way to entertain and at the same time feed your dog then the Tyker interactive dog toys might be just what you need. It is one of the best treat dispensing dog toy for puppies and small, medium, and large dogs. It is bone shaped and has a bright blue color that’s attractive and fun. This toy will keep them busy for hours trying to get to every treat in there. This toy is designed with a combination of features which makes it the ideal boredom breaker for your pet. The Tyker Interactive Treat Dispenser is made using a tough thermo-plastic rubber which helps it withstand the strong jaws of your dog. Unlike flimsy toys, this one will endure the constant biting and chewing by dogs yet still hold its form. Puppies and small dogs especially find this toy quite entertaining. Apart from dispensing their treats, the rubber material soothes their gums hence offering them the relief that they need. This is due to the small bumps all over the surface of the toy. This toy happens to have an ideal shape that will keep your little pup entertained for hours. The bone shape is an instant attraction but it is the contours that will facilitate a firm hold when they are reaching in for the treats. This is unlike a round shaped toy that will keep rolling away. The idea behind the Tyker Interactive Treat Dispenser is to dispense the treats at an interval which will keep your pet busy for a few hours. In this case, the toy is designed with a hole that’s just enough to dispense one treat at a time. Getting to every one of them is the fun part that will keep your dog occupied for a few hours. Your dog’s safety is paramount and their toys should always be friendly. It is advisable to check the safety of the materials used especially if it is designed to go to your dog’s mouth. The My Hound treat dispenser is BPA free and considered safe for your dog. In this case, the little hound can enjoy chewing on it without worrying about acquiring a disease as a result. This toy measures 12.7 cm in length and can hold adequate treats inside. This rules out the need to frequently monitor and refill it. The toy can hold just enough treats to last the pup a few hours. Considering the perks of the Tyker Interactive Treat Dispenser toy for small, medium and large dogs, this toy is indeed a worthy purchase. Every dog loves a treat so this toy will keep them occupied for ages! Arguably, treat dispenser toys are indispensable for anyone with an active dog. They are invaluable pieces of equipment because they keep your canine friend occupied while at home. Moreover, if you want to feed your dog’s brain by keeping them entertained and challenged, dog treat dispenser toys can come in handy. What’s more, treat-dispensing toys divert unwanted behavior and offer mental stimulation. Needless to say, food is an undisputed motivator, especially for dogs. That’s why we are introducing one of the best dog treat dispenser toy. This toy is highly recommended by experts and promises to give your dog unmatched happiness. If you are looking for a treat dispenser toy that won’t break your bank, consider this product. Manufactured from premium materials, this product guarantees the best value for your hard-earned money. What makes this training treat stand out from its closest competitors is the fact that all the ingredients included (duck, turkey, chicken, chicken gravy and potatoes) are freshly prepared which means a happier and healthier dog. This treat dispenser by Bounce and Bella promises to keep your puppy physically and mentally stimulated. Consequently, you will have a comfortable dog which means fewer anxiety issues that sometimes can lead to them chewing unwanted materials. Remember, a happy translates to a happy home. Due to the simple rubber design of this treat dispenser, it gets an edge over other products because it is easy to clean. It is also easy to refill, hence it gives your canine friend hours of fun, mental and physical stimulation while keeping them full at the same time. Remember, dirty is a primary put off for you and your dog, so ensure that the treat dispenser is cleaned frequently. 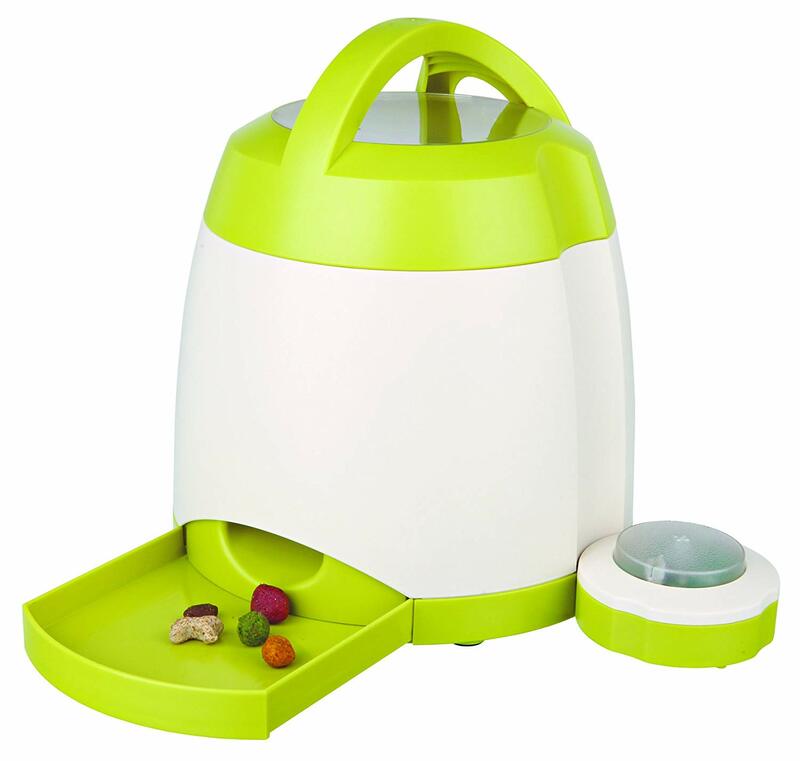 This treat dispenser allows you to add treats to the inside as well as the outside which means your puppy will have to spend some time nibbling out the treats. You can adjust how quickly your dog can get to the gifts, depending on how far you wedge those treats. They are made from 80% fresh poultry and 20% potatoes and chicken gravy. There are no additives, flavors, gluten, sugars or preservatives which give you the peace of mind that your dog cannot suffer from junk-filled treats. They guarantee quick results. The quality products used in these treats ensures that your dog gets the tastiest and healthiest treats. Your puppy will enjoy the training and every time looks forward to it. They are strong. It goes without saying that a tasty treat means a happier and easy to train dog. That is why this treat comes with a resealable and robust bag that helps to keep the treats healthy and tasty. At the end of the day, every homeowner wants a happy and a healthy dog. Investing in a quality treat dispenser toy is the first step towards achieving this dream. 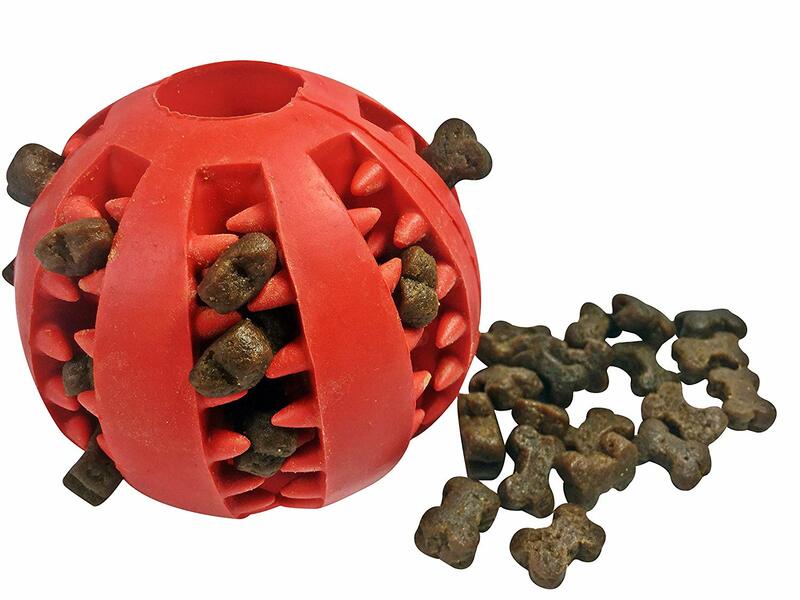 This treat dispenser ball is great and it comes with a pack of treats too! 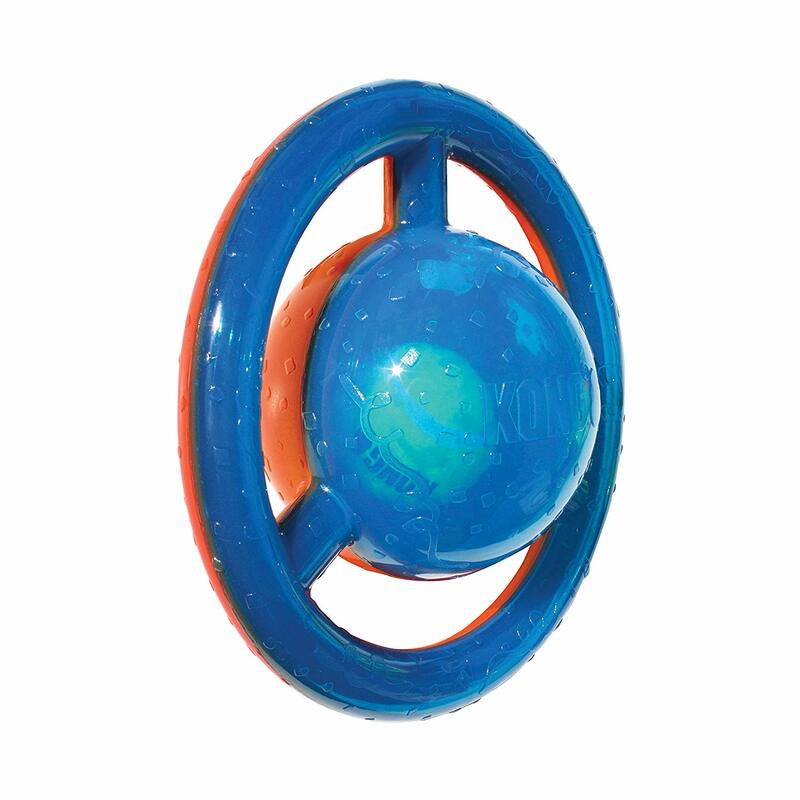 The Kong Jumbler Disc is an interactive toy which comes with a squeaker and a tumbling interior ball. Kong is one of the most trusted brands in the industry when it comes to dog toys. Their products are well known for being made out of indestructible rubber materials. The company aims to provide mental stimulation in the most entertaining way possible. Kong caters to all breeds and sizes of dogs, and is an industry leader in this market. The Kong Jumbler is an interactive two in one ball toy which provides twice the fun for your beloved pooch. It is made with an interior tennis ball which keeps dogs entertained. It also has a squeaker which produces a loud squeaking noise that encourages play. Kong has made sure that your dog will be able to pick up the toy easily. The Kong Jumbler is made up of indestructible rubber materials, like all their other products. Your dog will be able to shake the Jumbler easily. This incredible toy can withstand even rough play. It’s the perfect toy to use for playing fetch in your backyard or wide open areas. The Kong Jumbler Disc provides new adventures and added entertainment for you and your dog. It’s one of the best ways to ensure that play time will always be fun. It’s the perfect toy for dog owners who want to provide a stimulating activity for their beloved pooches. This product is encased with a durable plastic which makes sure that it could handle rough play. The Medium/Large size is best for medium breeds such as Beagles, Basset Hounds and Bulldogs. The Large/X-Large size is best for German Shepherds, Labrador Retrievers, Great Danes and English Mastiffs. Dogs absolutely love treats and the majority of dogs also like playing games. Combining the two creates an amazing product that is going to keep your toy occupied for hours. Let’s take a look at the Trixie Dog Activity Memory Trainer Strategy game so you can discover what it is all about. This product comes in a bright green/white design and it measures 24 x 20cm in diameter. It is really easy to use, basically the treats are put into the top of the product and there are a variety of features that test your dog’s memory and help him get his treat. If your dog presses the remote control included, the rewards will come out of the dispenser. This item is battery operated, with 3 AAA batteries being required for the Trixie Dog Activity Memory Trainer Strategy game to work to its full potential. Some dogs are smarter than others which is why there is increasing levels to really challenge your canine. You can start off easy and make the game a little more difficult as your dog becomes skilled at it. There is a rotating reservoir inside the dispenser, which is included for your convenience. There is an adjustable opening so that you can choose how quickly you want the treats released. The release button is really stable and there is an additional holder included to ensure this. It is a really sturdy product with rubber feet that make it non slip. You can be rest assured that whatever size your dog, they will be safe when using the Trixie Dog Activity Trainer. The product is really easy to set up and use, with full instructions for your convenience. This booklet also has handy tips and tricks for getting the most from the item. It’s really nice to spoil your dog from time to time and the Trixie Dog Activity Memory Trainer Strategy game is definitely an item that is worth investing in. It is fun, easy to use and will keep your dog occupied for hours, as they frantically try to release the treats from the reservoir. It’s always a good idea to keep your pets mind working and this product definitely does just that. A well stimulated dog means both pet and owner are going to be much happier so give this item a try today. Do you have a question about interactive dog toys? Can’t recommend the Trixie Dog Memory Trainer enough! My dogs absolutely love it. When they (eventually!) learned how to get it to dispense treats, they haven’t stopped using it since. It’s a great way to get them to eat their food at a slower pace at mealtimes. Well worth the price!